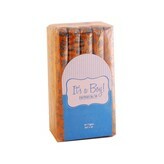 These bargain priced "It's A Boy Cigars" from J.C. Newman have a nice mild flavor. Dominican mixed filler tobaccos and slightly off color Ecuadorian shade grown wrappers combine to make a nice, smooth smoke at a great price. Factory Throwouts #59 It’s a Boy is a bundle of 20 cigars from J.C. Newman Cigar Company in Tampa. These inexpensive cigars have mild flavor supplied by Dominican mixed filler tobaccos and Ecuadoran shade grown wrappers with slight color flaws, yet still make for a pleasantly smooth smoke. The bundle is packaged in retro blue and embossed cellophane wrappers with adorable bears, bottles and pacifiers. This is your go to bundle to share with family and friends. I wonder how many people become cigar smokers after purchasing cigars upon becoming a parent. If you have just become a first time buyer of cigars because of this, there are a few things you should know on the matter. First, find a reputable tobacconist. Most towns and, of course, large cities have tobacco shops. If you prefer, you could certainly do research on line, but finding a knowledgeable tobacconist is best. His or her knowledge will be extremely helpful and informative. Make clear to them your budget and stick to it. An expensive cigar does not always mean higher quality. There are many fine budget cigars available. Second, select cigars that are described as “mild” and “creamy”. These cigars having light brown wrappers, usually shade grown, have a smoother smoke. They are perfect for the beginner and others who only smoke occasionally. Lastly, go with a dependable brand like J.C. Newman. There are many ratings and reviews on line. Cigar Aficionado is a great site to assist you in picking out that perfect bundle of joy....to celebrate that perfect bundle of joy!